International co-prosecutor Nicholas Koumjian rejected an argument made by the defense team for the regime’s “Brother Number Two” Nuon Chea on Monday that the indictment had illustrated a “deep bias” against the core beliefs of socialism, as well as that the lives of Cambodians had improved under the Pol Pot regime. “Nuon Chea and [regime head of state] Khieu Samphan are not charged here with being communists. They’re not here because they were bad economists, although they were,” Mr. Koumjian said. “They’re here, not because they set up cooperatives, not because of that alone, but because they set up cooperatives where people were enslaved, where they were denied fundamental freedoms,” he continued. “Many countries around the world espouse socialism or communism, but they didn’t have the results, the policies, the infliction of suffering upon the people that this regime did,” he said, citing a recent demographic study putting the death toll attributed to the regime at 1.9 million, or 21 percent of the population. 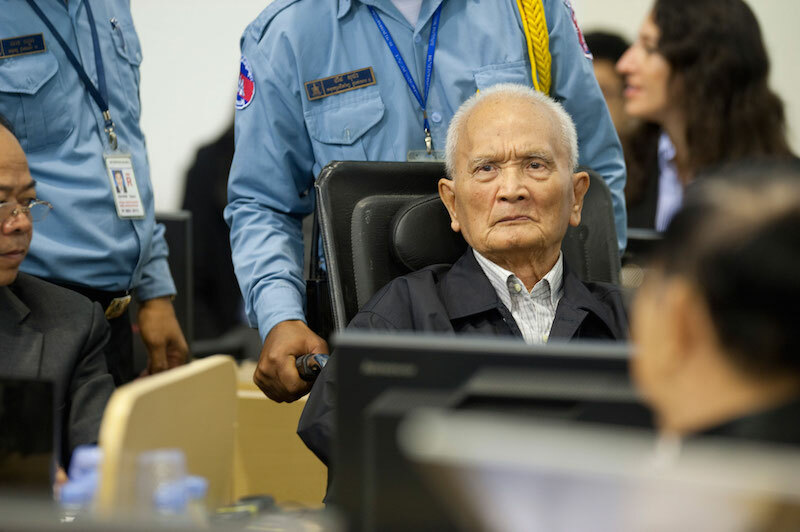 The U.S. prosecutor then directed his attention to the Nuon Chea defense’s assertion that there was no genocidal policy against ethnic Vietnamese and that any talk of “Yuon enemies” was strictly in military terms. He cited a speech by Pol Pot in which he said he planned to kill 50 million Vietnamese, a 1978 article in the regime’s Revolutionary Flag magazine stating that “not one seed” of Yuon remained on Cambodian soil, and a report to the party center from the regime’s West Zone indicating that 100 “ethnic Yuon including small and big, adults and children” had been smashed. “This document makes absolutely clear—we have a written report to the center—saying we are fulfilling the center’s policy against the Yuon and we’re killing them, including children,” Mr. Koumjian said. Nuon Chea’s inconsistent claims about his knowledge of Phnom Penh’s notorious S-21 detention center was also targeted. Mr. Koumjian contrasted a quote from Thet Sambath’s book “Behind the Killing Fields,” where Nuon Chea admitted he “doesn’t apologize for S-21” with a media interview he gave in which he claimed he had never even heard of the prison. “It’s one of many, many lies that Nuon Chea has told,” the prosecutor said. Occasions when Nuon Chea has appeared to show remorse and concern for those affected by the Khmer Rouge were disingenuous, he also claimed. “While he sometimes expresses his moral responsibility and talks about his concern for the victims, your honors, those are crocodile tears,” Mr. Koumjian said. The defense’s claim that the eventual invasion by Vietnamese-backed troops legally justified the killings of suspected masterminds of traitorous rebels in the name of national security had no legal basis, he said. “The Nazi regime lost the war, it doesn’t justify their crimes. The Ottoman Empire ceased to exist after the First World War, it doesn’t justify the crimes that occurred. The Hutus lost to a Tutsi army that invaded, it doesn’t justify their genocide,” he said. “I heard for the first time a new case: the ‘Gang of Three.’ It’s almost like the title of a nice action movie,” defense lawyer Anta Guisse said. The French lawyer also claimed the term “genocide” was a propaganda tool used by Vietnam in the 1980s, and they had not used the term to refer to the treatment of the Vietnamese under the Khmer Rouge. “If genocide against the Vietnamese was so flagrant and so significant, why did the Vietnamese—who should have used this in their propaganda at the time—why are they not talking about the [genocide] against the Vietnamese?” she asked.